Sharing special moments in your own backyard is easy with the PPU-420-U offset Patio Umbrella from CorLiving. This versatile offset umbrella can be used to create a comfortable shady spot on your patio. Made with a durable steel frame and a UV resistant umbrella fabric this product looks great and is ready to withstand the elements of the outdoors. With only simple assembly needed upon delivery, means you can create your place of shade in minutes. Share special moments in your own backyard with the PPU-320-U Patio Umbrella from CorLiving. Air vents ensure your seating area stays cool on hot summer days. Durable Grey/Black steel frames and UV resistant polyester look great and will withstand the elements of the outdoors. Assembly and storage is simple with a convenient crank and pulley system. Share special moments in your own backyard with the PPU-260-U Patio Umbrella from Corliving. Air vents and hanging side flaps ensure your seating area stays cool on hot summer days. Durable Grey/Black steel frames and UV resistant polyester look great and will withstand the elements of the outdoors. Assembly and storage is simple with a convenient crank and pulley system. The beautiful resort quality Freeport 11-ft cantilever-style umbrella with designer valance provides 86 square feet of optimal shade without the pole getting in the way of conversations and entertaining. 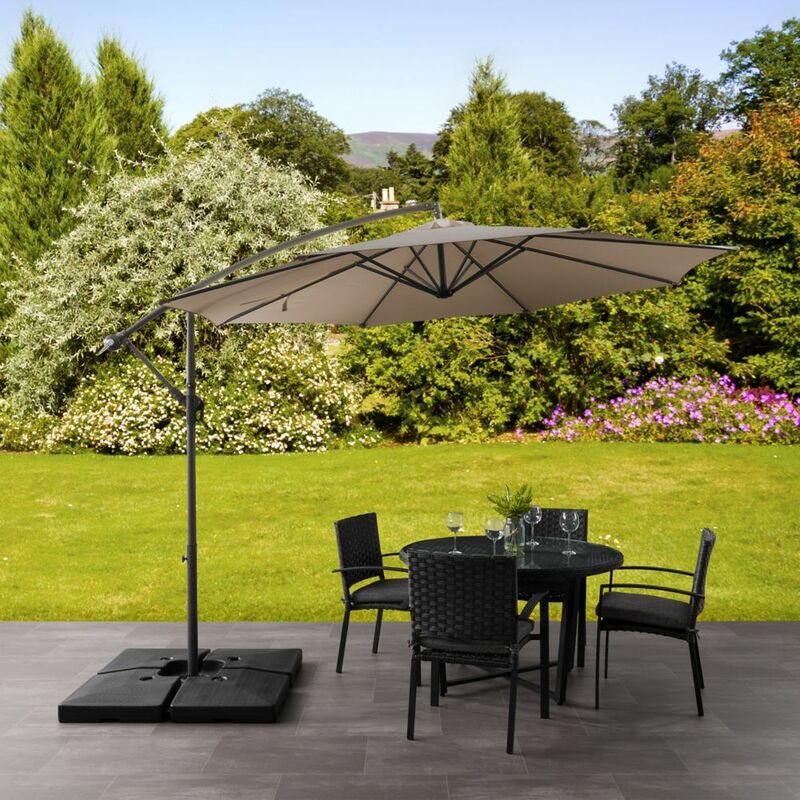 With effortless one-handed crank operation for opening and lowering the umbrella canopy and our patented 360 degree tilt mechanism, you can tilt the umbrella in any number of positions to ensure desired shade from the sun all day long. Its sturdy 2-in offset pole and 8-rib support system are made of aluminum and covered in a rich bronze powder-coated finish for extra protection. The oversized commercial grade canopy is crafted from high performance durable weather and fade resistant Sunbrella fabric. The brown rugged high quality weather resistant resin base can be filled with up to 225 pounds of sand providing firm anchoring even on the windiest of days. 5 Year warranty on the Sunbrella canopy; 3 Year warranty on pole and umbrella structure. Offset Patio Umbrella in Sandy Brown Sharing special moments in your own backyard is easy with the PPU-420-U offset Patio Umbrella from CorLiving. This versatile offset umbrella can be used to create a comfortable shady spot on your patio. Made with a durable steel frame and a UV resistant umbrella fabric this product looks great and is ready to withstand the elements of the outdoors. With only simple assembly needed upon delivery, means you can create your place of shade in minutes.